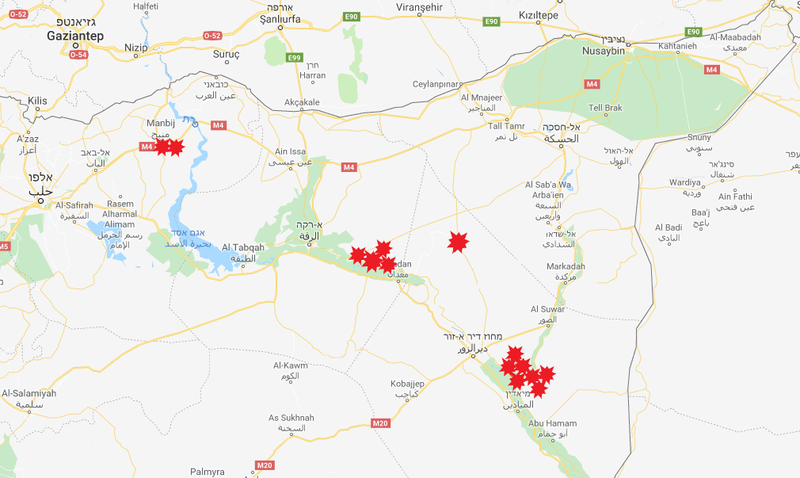 During four days, between April 8 and 11, 2019, the various ISIS provinces in Syria, Iraq and around the globe carried out a wave attacks in retaliation for the blow ISIS suffered in Syria. ISIS reported that eight of its provinces carried out more than 92 attacks in more than 80 areas. The attacks were accompanied by a media campaign and claims of responsibility entitled “Battle of vengeance for blessed [Province of] Sham” [Syria]. The following is the distribution of the attacks according to an ISIS announcement: the largest number of attacks was carried out by the Iraq Province (37 attacks, more than one third of the total number). 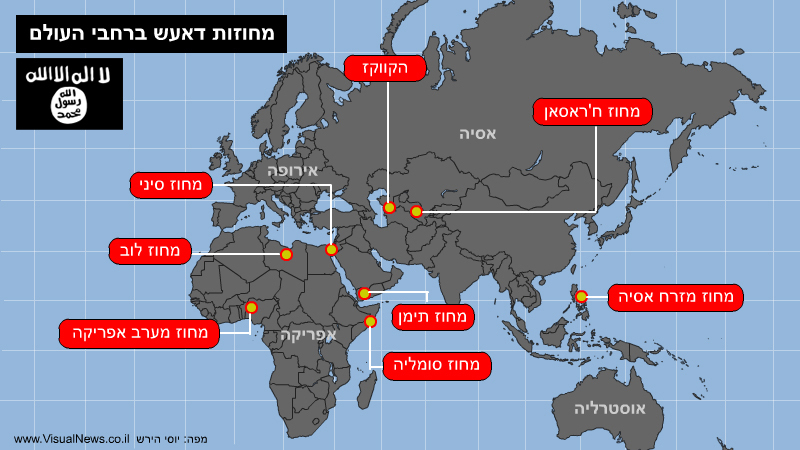 Following them were the provinces in Syria (30 attacks), West Africa (five attacks), Sinai (five attacks), Somalia (five attacks), Khorasan (three attacks), Libya (two attacks) and the North Caucasus (one attack). Most of the attacks were directed against security targets and were relatively uncomplicated. They included shooting attacks, detonating IEDs, ambushes, attacks on military camps and compounds and the execution of “collaborators.” Very few were suicide bombings or complex attacks. In ITIC assessment, the attacks and accompanying media campaign were orchestrated by the ISIS leadership. Their objective was to raise the morale of ISIS operatives and supporters around the globe. They also aimed to send a message to the American-led coalition countries that despite the severe blow inflicted on ISIS in Syria, ISIS is growing stronger and its operatives are still active in Iraq, Syria and around the globe. In effect, the ISIS leadership did in fact prove that even after the loss of its province in the lower Euphrates Valley, it continues to function and is capable of carrying out a concentrated, extensive, coordinated effort in all its provinces worldwide. The retaliation attack illustrated that ISIS has changed into a global terrorist organization which focuses on guerrilla attacks on its many enemies, especially the security forces in the countries where it operates (while continuing its activities against Shi’ites and other groups of populations its considers “infidels”). The intensity of the attacks in its various provinces reflects the operational capabilities of each province. Judging by the number of attacks, the Iraq Province has become the center of its guerrilla-terrorist activities. In Syria, on the other hand, ISIS continues to operate mainly in the northeastern and northern parts of the country but its capabilities are less than those in Iraq. Beyond its core provinces, the most prominent is the West Africa Province, where the organization operates in Nigeria and neighboring countries. Also prominent is the Sinai Province, where despite the continued pressure of the Egyptian security forces, it has managed to carry out a series of attacks, some of them showcase attacks. The ISIS province in East Asia retains its ability to withstand the intensive activities of the Filipino army in the southern part of the country. In the recent wave of retaliation attacks there was a conspicuous lack of ISIS-inspired attacks in Western and other countries (beyond ISIS’s provinces). The campaign against the ISIS enclave in the lower Euphrates Valley was also not accompanied by ISIS-inspired attacks in the West. During the four days of retaliation attacks ISIS called for attacks by its supporters abroad, especially in the West, but none was carried out. That may indicate the weakening of the ISIS brand among the Muslim communities in Western countries around the world, at least temporarily. However, it is still too early to reach any definite conclusions about the matter. The wave of retaliation attacks was accompanied by a media campaign called “The battle of vengeance for blessed Sham Wilayah [“province”],” i.e., attacks carried out to avenge the blow inflicted on ISIS in the lower Euphrates Valley. Most of the claims of responsibility were issued via Telegram. Some of them were also posted to ISIS’s Shabakat Shumukh website, and to a lesser degree on the Akhbar al-Muslimin website. That may indicate that those are ISIS’s main information platforms. On April 11, 2019, ISIS’s weekly magazine al-Nabā’ (issue 177) published an infographic summing up the retaliation attacks carried out between April 8 and 11, 2019. It was accompanied by a statement from ISIS spokesman Abu al-Hassan al-Muhajir. The main objective of the attacks, he said, was retaliation for what happened in Syria. He called on ISIS operatives to avenge the blood of their brothers and sisters and to carry out retaliation attacks that will uproot the “infidels” and “atheists.” He called for suicide bombing attacks, IED attacks, sniper fire and the detonation of car bombs (al-Nabā’, April 11, 2019, based on Shabakat Shumukh in Arabic, April 12, 2019). ISIS infographic (al-Nabā’, April 11, 2019). The notice reads, “The retaliation invasion of the blessed al-Sham Province is on the way – the Islamic State following the path of the Prophet [Muhammad] – military actions of the jihadi fighters for the sake of Allah [with a reminder of the suicide bombing attacks in the Sinai Peninsula and the takeover of the town of al-Fuqaha in central Libya carried out as a retaliation attack] – Allahu akbar and glory to Islam (Telegram, April 10, 2019). During the retaliation attacks ISIS supporters issued notices calling for attacks in Western countries. No attacks were carried out. Right: Notice posted by an ISIS-affiliated source to Telegram. The Arabic reads, “One body#retaliation_campaign” (Telegram, April 10, 2019). 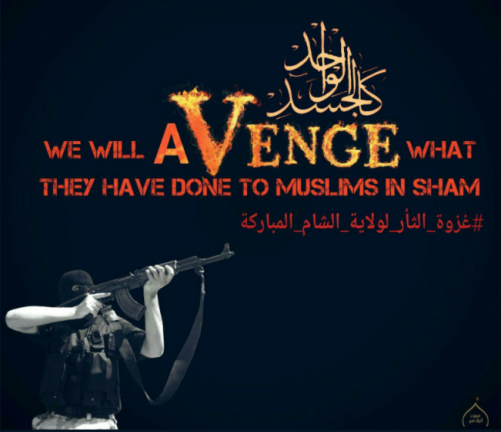 Left: Poster from an ISIS-affiliated source calling itself “Nur al-Tawhid” (“the light of the oneness of Allah”). 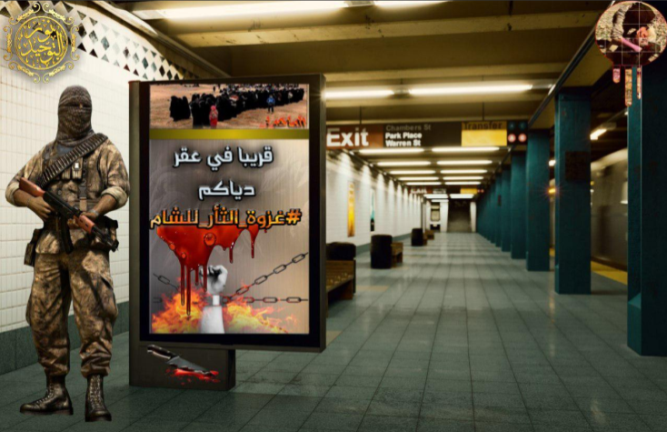 It shows the World Trade Center subway stop in New York City with an ISIS operative next to a sign that reads, “Soon [we will operate] in the middle of your countries” with the hashtag of the retaliation attacks on the social networks (Telegram, April 10, 2019). In Syria ISIS attacks focused on the Kurdish forces in the al-Mayadeen and al-Raqqa areas in the Euphrates Valley, where there are routinely intensive guerrilla activities. Attacks were also carried out in Manbij and al-Hasakeh in northern and eastern Syria (areas controlled by the Kurds). Most of the attacks involved detonating IEDs to attack the vehicles of SDF forces, and some were shooting attacks and executions of SDF commanders and fighters. Assassination attempt on the life of a senior figure in the security forces, 25 kilometers northeast of al-Mayadeen. Killing of a fighter in an elite SDF unit and taking another fighter hostage in the village of al-Busayra, about 14 kilometers north of al-Mayadeen. Shooting attack and detonation of two IEDs to attack two SDF vehicles, about nine kilometers north of al-Mayadeen. Detonating an IED to attack an SDF vehicle in the region of the village of al-Busayra. Attack on an SDF roadblock, about 11 kilometers north of al-Mayadeen. Break-in into the homes of two military intelligence agents, 11 kilometers north of al-Mayadeen. The two were shot to death. Shooting a Syrian soldier to death while he was on leave in his village, about nine kilometers north of al-Mayadeen. Detonating an IED to attack an SDF vehicle, five kilometers east of al-Mayadeen. Two SDF fighters were killed. Shooting at a roadblock, 36 kilometers east of al-Raqqa. Three SDF fighters killed and five wounded. Detonating an IED to attack a vehicle, about 33 kilometers east of al-Raqqa. Six SDF fighters wounded. Detonating an IED to attack a vehicle, about 43 kilometers east of al-Raqqa. Three SDF fighters killed or wounded. Shooting at a vehicle near a roadblock, about 43 kilometers east of al-Raqqa. Shooting and killing two SDF fighters, about 70 kilometers north of al-Raqqa, near the border with Turkey. Blowing up a motorcycle and killing two SDF fighters east of al-Raqqa. Blowing up the home of an SDF commander. Detonating an IED to attack an SDF forces’ vehicle. Three SDF fighters killed. Detonating an IED to attack an SDF forces’ vehicle on a Manbij street. Four SDF fighters killed. Detonating an IED to attack an SDF forces’ vehicle in a rural area near al-Shaddadi. Two SDF fighters wounded (RisboLensky Twitter account, April 10, 2019). Shooting attack at four SDF vehicles transporting fighters in the al-Hasakeh region. About ten SDF fighters killed or wounded, among them two commanders (RisboLensky Twitter account, April 10, 2019). In western and northern Iraq a wave of attacks was carried out in the various provinces. Most of the attacks targeted the Iraq security forces (although some targeted Shi’ite civilians). There were various types of attacks: detonating IEDs (the most common type), detonating a leech demolition charge (a magnetically-attached explosive device) to a vehicle, attacking military bases and headquarters, shooting attacks, executions of “agents” and detonating a car bomb. Detonating IEDs to attack two Iraqi army vehicles in the center of the city of al-Qa’im, near the Syrian border. Eight Iraqi soldiers were killed or wounded. Detonating a leech demolition charge (a magnetically-attached explosive device) to the vehicle of an Iraqi army intelligence commander in al-Qa’im. The commander was killed and his vehicle was destroyed. Attacking an Iraqi army headquarters near the Jordanian border. ISIS claimed 11 Iraqi soldiers were killed or wounded. Killing a Shi’ite [civilian] with an IED about 60 kilometers northeast of Baghdad. Detaining a tribal recruiting activist and “agent” of Iraqi national security in the northern suburb of Baghdad. Detonating an IED and throwing hand grenades at the home of a policeman in Tarmiyah, about 30 kilometers north of Baghdad. Firing light arms at an officer in the national security forces in al-Taji, 16 kilometers north of Baghdad. Killing a Shi’ite [civilian] in a village about 70 kilometers northwest of Baghdad. Attacking a tribal recruitment headquarters east of Fallujah with light arms and hand grenades. According to an ISIS report, ten tribal recruitment activists were killed, including a local commander. Detonating an IED to attack a vehicle of the Iraqi police force east of Fallujah. Three policemen in the vehicle were killed or wounded. Detonating an IED to attack a vehicle of the Iraqi police force in the center of the city of Ramadi. Detonating an IED to attack a vehicle of the tribal recruitment in the region of al-Shirqat, about 100 kilometers west of Kirkuk. According to an ISIS report, a colonel in the police force and two of his companions were wounded. Detonating an IED to attack a popular recruitment vehicle about 30 kilometers west of Khanaqin. Six popular recruitment fighters were killed or wounded. Detonating two IEDs to attack an Iraqi army vehicle and a concentration of Shi’ite forces (“infidels”) about 30 kilometers west of Mosul. One soldier was killed and another wounded. Detonating an IED to attack a foot patrol of Iraqi policemen about ten kilometers north of Baqubah. Three policemen were injured. Detonating four IEDs to attack two vehicles of the emergency police force and the tribal recruitment about 20 kilometers south of Fallujah. Six people in the vehicle were killed or wounded. Detonating a car bomb to attack a convoy of the Shi’ite Badr Militia north of Baiji. Fighters in the convoy were killed or wounded, including a commander. Throwing a hand grenade at an Iraqi army post in the Old City in the western part of Mosul. An Iraq soldier was killed and another was wounded.